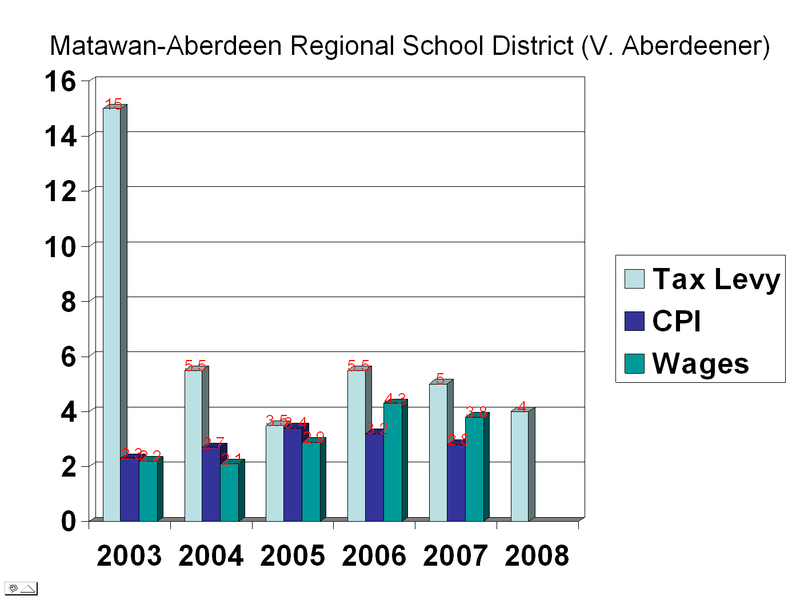 Note: I have uploaded a chart comparing a recent history of school property tax increases, inflation, and wage growth. Despite a stable student population, school taxes outpace inflation and consume a larger share of income. My chart is slightly different from the one presented by the district. The district will claim last year’s tax levy rose only 2.3% and this year’s will only rise 2%. The truth is that last year, after the budget was defeated, they cut appropriations without cutting spending – in other words, they used deficit spending in place of higher taxes. However, the true cost to taxpayers remained the same. This year, the 2% figure discounts the state-financed tax relief. This is like the school district pocketing your homestead rebate check and then claiming they didn’t take any of your money. Some months ago, in private conversation with one of the BOE members for the Matawan-Aberdeen Regional School District, I had argued against using a zero-based budget approach. I urged the board to use a “fixed income” approach, meaning you set a limit on how much money you can spend. Otherwise, there is no limit. At the time, I never imagined they would use my idea but set their spending limit to the legal maximum. I recognize the board and administration have spent over a thousand man-hours working on the budget and cut $3 million from expenditures to meet the state-imposed growth limits. I also realize that every budget line has a constituency. And I understand their primary concern needs to be the welfare of the students. Yet, there’s no denying the district started the budget from the maximum tax levy and worked their way backwards. The proposed budget raises taxes and spending by the statutory maximum. How does this comport with the district’s commitment to balance its needs against those of the taxpayers? Over the past several years, taxes and spending have risen faster than inflation and wage growth, even when the student population is stable (see chart). Why? What initiatives has the district undertaken to generate additional non-tax revenue streams and how successful have those initiatives been? What has RTI achieved that qualifies it for additional funding? Why do we continue financing Huskievision during economic hardships? Why does the district purchase new equipment when used and refurbished will often suffice? Won’t voting for the budget put the taxpayers at risk of a larger increase the following year since budget caps are based upon a percentage increase? Given the history of voters rejecting past budgets for being too high, why would the board, our elected representatives, submit a proposal that raises taxes to the legal maximum? I’m certain we’ll be hearing again how the tax levy is only going up 2%. Remember, that number would be 4% except the district has confiscated our tax relief money from the state. In college, one of my professor’s once attributed a line to Pierre Du Pont – Nothing grabs a man’s attention like a noose a around his neck. Sadly, the district will never truly reduce spending until they have no other option. >>> Read more! What do you expect? Just look at the school board make up at present. While several of the recent members are degreed and experienced in the private sector with finance and computer literacy far in excess of members in the years past. The make up of the school board is women and men with limited knowledge of real decisive budgetary experience in the handling of millions upon millions of dollars. $54 MILLION (+ -) THIS YEAR ALONE, Our tax dollars. Forget the debacle that was the SSC (school construction council)run by handpicked political leeches and charlatans, whom to this day have not been brought to anything close to accountability for their malfeasance and criminal conduct. Criminal conduct with a cost to the taxpayers of the great State of New Jersey of over $8.5 BILLION DOLLARS. Once again, NO ACCOUNTABILITY ! So how can we truly expect local residents serving on the school board and acting on the advice of the deeply entrenched, union controlled and supposedly experienced business administarators and hired-gun accountants, to do what is best for our community much less its students. That is not the reality for most districts in our state. Just look at the salaries of our administration and others whose duties and input are very questionable. Back in 1978 the high school had a principal and a vice principal now we have four to six for that same job. Sure kids are different when you take into effects many factors. Here is the factor I look at. Are the learning and test scores increasing at the same excessive levels as the spending of our tax dollars? The answer is NO ! Money is spent and far too often vast amounts of money is wasted, but the test scores rise very little, if any. Sure test scores went up this year but once again not at the same rate as excessive taxation. Think about it ! I do every day. JM Is right on the money. Why is it that those we elect to serve, end up serving themselves? Look at the infighting on the school board and input on the Aberdeener. Look at the reality that is that which purports to be leadership in Matawan and Aberdeen. From Donna in the beach. Another great topic from the Aberdeener. The daily readers who log on and check this out and who do not put themselves into the fight should be ashamed. This goes for all of the workers within the Bd. of Ed. who watch what goes on everyday, and just accept it as the normal daily events. They watch the monies just pass like water and their silence is deafening. They should be ashamed. That goes for all of you at the municipal buildings in Aberdeen and Matawan as well. You too Norman. Thats right Norman knows no shame. He is a lawyer after all. Shame on you. All of you. Is Middlesex Jim and JM the same person? Who cares as long as the info keeps coming in. Keep it up JM and Middlesex Jim. Every Tax payer and parent should go on the MARDS webpage and click on TEST RESULTs.... The academic performance of this district is a disgrace. The former administration and those who supported them on that board should be in shame over these poor results as they are directly to blame. In all honesty, I thought it took great courage to post those results on the home page of the school website. Although I share your anger over the dismal test scores, I applaud the school for not only posting them, but for doing so in a fashion that provides a true picture. Nor did the administration postpone the presentation until after the April voting. Open communication is the first step towards progress. I offer my thanks to the administration and the school board for the presentation, especially in light of those wretched test results. What are well supposed to do sit around in a circle and sing 'we are the world' or something like that. I was no math whiz but even I know that the numbers have not added up for many years. The number of administrators and their high number salries for doing what I still do not know. The trest score numbers so abysmal for far too many years. The number of teachers and their ever increasing salaries far above the average worker. The number of jobs given out in the past by the Barbato and Zavorskas dictatorship, all to have the same people beholding to them and to assure their close control of the PTO's, that act more like a PAC (Political Action Commitee) than the people who are supposed to be worried about the students. Unfortunately the students and taxpayers always pay the price. Well people get the word out as the Zavorskas Barbato group is out to get control again. I know how I am voting in Aberdeen, Ken Aitken and no one else gets my vote. Let them see the voter numbers who would not give a second vote for the Barbato-Zavorskas puppets nust to pull the switch to vote for two. We cannot let them back in control. Sure Kenney, O'Connor, Gambino and Aitken have been blamed for keeping Barbato and Zavorskas at more than an arms length from control, and I say THANK YOU TO ALL OF THEM. Aitken represents the students and does the best for them, not like the Barbato-Zavorskas team and their minions, who want the power back only, to divide. April 15th send the Z and B team a message. We like it when they are in the minority. By the way Mr. O'Malley keep Zavorskas and her kind out of your office. Let her stay home and reflect on what she did to this district, and the price the taxpayers still pay, for her actions and divisivness. I don't get you people. Once again we are getting a huge tax increase even after more state aid. The performance of the district and this entire board has been unsatisfactory. Vote this budget down and demand real cuts from the council who is raising our taxes 9.9 cents. Nothing is going to change unless we start demanding more from these people, no matter who they are. Lisa G that was great and once again honesty prevails. Z and B team out the door soon or at least we can continue to watch Zavorskas at each and every school board meeting sit there with nothing to do but sulk and remember the power she lost. If Z an B get the power back in this election, this district will go back to the way it was with the former superintendent; giving friends of Z and B jobs, having them run the schools and putting the kids last. It is up to the voters to decide what they want.